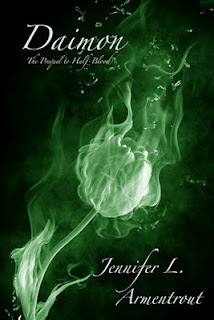 This is the second book by Jennifer that i have read and i must say once again i was not disappointed! i thought this was an amazing start to set the seen for half-blood and i can't wait to start half-blood i was totally hook and ended up reading the book in one sit! Alex is a descendant of the gods! her mother is a demi-god but her father is mortal leaving her a half-blood. Being a half-blood leaves Alex with only two choices one is to become a slave for the pure-blood and the other is to become a sentinel and protect pure bloods from the daimon pure bloods who have turned evil! however these options are taken way from Alex when her mother takes her on the run running from her world and everything in it the gods, pure blood sand half-bloods. with no explanation to why she is on the run Alex feels she doesn't fit in with the mortals and must rely on her mother for support, guidance and reassurance. when daimons find her and her mother she finds herself alone and trying to get back to the world that may save her, with no knowledge of why her mother left could she be making the wrong choice? I haven't read many prequels so i was surprised how much i enjoyed this one. it introduced the main characters in an action packed way! there was no boredom or slow moving story line i found myself draw in on every page and even crying when Alex's mam dies! it was so moving! i can't wait to continue the story! am starting half-blood now!!! again i have no rating thingy but 4 stars! Sounds promising! Can't find a Kindle version for now but will add it to my list of books to check at the bookstore. hey thank you for following!